A movie starring martial-arts giants like Michael Jai White, Scott Adkins, Tony Jaa, Iko Uwais, and Tiger Chen sounds like “the Avengers of martial arts movie stars.” Such a promise for unstoppable force means even an ounce of exposition-heavy plot is going to feel like a chore as the movie builds towards confrontations. Unfortunately, Triple Threat, the movie that pulls off the feat of gathering such a cast, stuffs its brief 95-runtime with unnecessary sub-plots and incoherent shootouts that distract from the punching and kicking. But if you can withstand the pain of story machinations, the action is there. Triple Threat starts with a Chinese businesswoman (Celina Jade) deciding to take down a crime syndicate that is prevailing throughout the city. This pisses some people off, so a group of mercenaries are hired to silence her. Payu (Tony Jaa) and Long Fei (Tiger Chen) are the guns for hire who realize too late that they’re not working on a humanitarian mission, but instead aid in releasing an international terrorist named Collins (Scott Adkins, who is literally wearing an iron mask when we meet him). 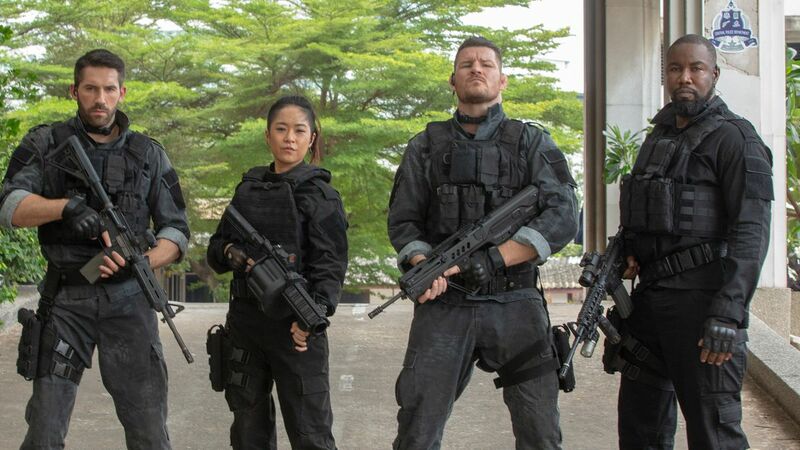 The two are left for dead, but later encounter Jaka (Iko Uwais), a local man whose wife was killed in the operation that annihilated his entire town, courtesy of Devereaux (Michael Jai White), Mook (Jeeja Yanin) and Joey (Michael Bisping). Jaka, Payu and Long Fei reluctantly work together to get their revenge on the three bad guys (White, Bisping and Adkins), but to get there, Triple Threat takes a Batman v Superman approach to team-ups, with the soon-to-be allies first fighting each other a couple of times due to dumb misunderstandings before finally finding a common goal. Oddly enough, the most fun to be found in Triple Threat involves the banter between these three screen legends. Ready to fight the triple villain threat is our main triple threat. Iko Uwais may not be the greatest dramatic performer, but he does a solid job portraying the grief of his character and a deep wish for revenge. Uwais’ Jaka doesn’t really trust anyone, and he really gives no reason why you should trust him either, which is part of the fun in his dynamic with Payu and Long Fei. Meanwhile, Tony Jaa and Tiger Chen shine as they get most of the film’s comedic banter. Triple Threat also has some dialogue issues. Because you have an Indonesian, a Chinese, and a Thai star, they mostly communicate in English, which makes the already weak dialogue sound even worse. Even native English speakers like Bisping sound weird in context. More aggravating is the overall pacing and editing style of the film, which insists on cutting away from the action scenes to introduce sub-plots or cliché proclamations. The overall action philosophy of Triple Threat feels misguided. The biggest Asian martial arts actor working today, Iko Uwais, spends most of the film working a gun in a series of shootouts. Thankfully, director Jesse V. Johnson wears his stuntman background on his sleeve and manages to make gunfire pop. Not surprisingly, both his directing and the movie itself shines once the guns are thrown away in favor of good old fists in the third act. The action is bone-crushing, limb-twisting intense, and Johnson uses a handheld camera to help make the action feel fluid in addition to getting the audience so close that you’ll feel every punch and spin-kick coming your way. It all culminates in one hell of a badass double team where Jaa and Uwais take on Adkins. Triple Threat feels like a throwback to the action films of the ’80s and ’90s in terms of music, tone, and style. But when it comes to the action, even the worse of Triple Threat looks better than most of the films one could compare it to. While the plot may be distracting, the martial-arts action is just as stellar and threatening as you hope it would be.